Nowadays modern mobile users are very exigent – they want outstanding, unique material design, in-app maps, fast and precise geolocation, social (let’s use the synonym – Facebook) sign-in, and more. The problem is that these elegant features require significant space. Every line of code you write is transformed into some weird thing called virtual machine bytecode – which, eventually, is going to be executed by a virtual machine. You might wonder: so what? 65,536 is a pretty big number, I will never reach that! Well in theory – yes. In practice – no. Every library you add, every .dll you reference adds methods/classes/and more. Also, it has to be transformed to a dex file. For instance: including Google Play Services adds about 30,000 methods to your small, tiny Android project. Almost half of the available limit! Let’s see what happens when you reach said limit. We will start with a small sample. Check MSBuild project build output verbosity to “Detailed” – we want to get a detailed error message in case of build failure. Create a clean Android project and add packages.xml file (see below). 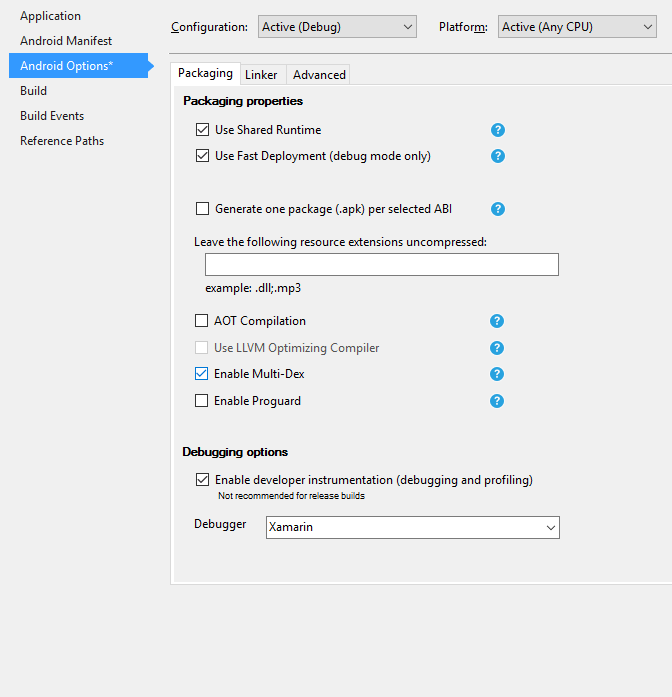 Type in Nuget Packages Manager Console Update-Package -Reinstall. Make sure you have Java Max Heap Size set to 1G in your Android project options. Without that, Java process used during app compilation will crash due to OutOfMemoryException. … and we even haven’t written a single line of code. We have Material Design libraries – either provided by Android Support Libraries or custom one, we have HockeyApp crash-log support, Geolocation, Maps, Ads support and… and we failed. As I have previously described – the problem lies in .dex / Dalvik Instruction set limitation. MultiDex is a technique of splitting your application code into multiple .dex files – each containing at most 65 KB of bytecode. Now try to build the project. Build error should go away, the application should work. 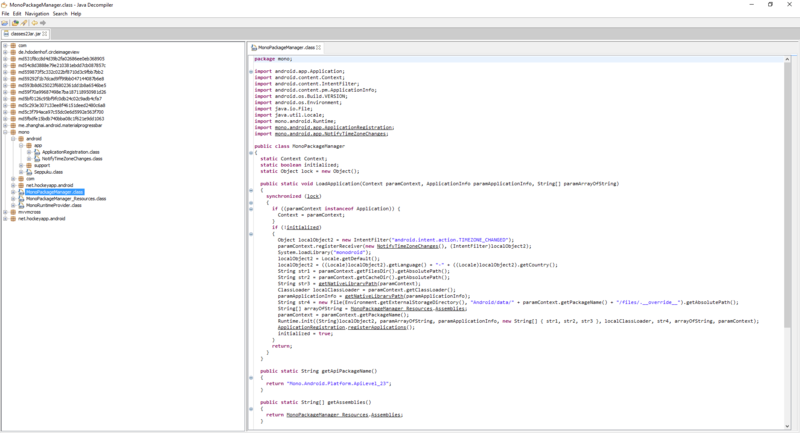 Let’s run our new sample application on device/emulator with Android 5.0 or higher. Works as expected – the app does nothing. It’s crashing. By examining logcat logs we can see it crashed with NoClassDefFoundException. Why Does the Application Crash on API Less Than 21? The problem is: some important code related to MutliDex/Application initialization can accidentally land in a secondary .dex file – therefore we will see an exception similar to the one shown on the picture from previous paragraph (cause code from secondary dex can’t be loaded on app Startup!). The reason why we have added loads of libraries and custom application class is to “manually” provoke moving Application initialization classes to secondary dex file (this step usually is done automatically – by your in-app source code). Sometimes, your application might even work fine on API less than 21, but it can crash when it’s loaded by some kind of service (like application launched by push notification handler service) – code needed to launch an app by push notification can be moved to secondary dex file (real-world example I had in past)! In an ideal world, it should work automatically. However, Android SDK Build tools is not bug-free. During the build, Android SDK tools automatically detect what is important and what should be kept in the first .dex file. It does not always work perfectly though. Android has some kind of “MultiDex.keepthat classes in first dex” file concept. You add class names you want to preserve in a text file and they won’t be moved to secondary dex file. We just need to find out which classes we need to preserve. The fastest and most reliable way to do that is by examining and decompiling .dex bytecode. 1. Go to your %Project Root Folder%/obj/Debug/android/bin, copy classes2.dex file to your dex2jar tool folder. Rebuild the app. It should work now. By now you should know how to bypass the 65kB limit and how MultiDex process works – if you use it, make sure you completely test your app on API less than 21. We have to be careful because MultiDex has its pitfalls. Before going with MultiDexing – try to decrease application size using Proguard or Xamarin Linker. MultiDex can increase Startup Time up to 15% on Dalvik-based Android devices (due to secondary dex file loading on startup). Want more news and tips on mobile development?